Grab your paper hat and a pair of pocketless slacks ! You and your friends just started work at the world’s most popular crab-based fast food chain, « McJohny’s ». In the kitchen, time doesn’t stop. We’re cranking out crabs at full speed ! While you man the grill, your pal is already starting up the bike to deliver his first order on time. You can’t afford to be the weak link in this chain ! ... <lire la suite>. Grab your paper hat and a pair of pocketless slacks ! You and your friends just started work at the world’s most popular crab-based fast food chain, « McJohny’s ». In the kitchen, time doesn’t stop. We’re cranking out crabs at full speed ! While you man the grill, your pal is already starting up the bike to deliver his first order on time. You can’t afford to be the weak link in this chain ! 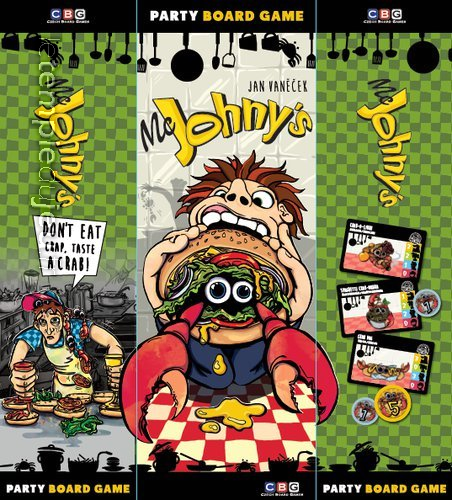 McJohny’s is an action-packed party game for 3 to 6 players that takes about 20 minutes. The game is comprised of different mini-games. Each shift, one player is the manager and decides who has to do what. Together they try to satisfy some of the four customers that come to the restaurant. Employees are allowed to work only one minute because of very strong unions. Also due to the low budget, there aren’t always wages for everyone, so not all of the staff wants to cooperate. In the end you count up your acquired little crabs — the only currency usable at McJohny’s — and trade them in at the restaurant gift shop. Maybe you’ll earn enough to go on holidays to Crab Island !